The best gaming speakers are the ones that can give you the most genuine surround sound, so that you can immerse yourself in the reality of a game and be part of the action. While the realism of games has increased a lot, the sound in games has evolved very much in the last years as well. In order to fully experience the sound that games can have today, acquiring a gaming set of speakers is a must. Very good speakers can be found in all price ranges. These two speakers are ten inches tall and have a five inches circular base. Even if the system may seem to be just a simple stereo set of speakers, each speaker has a built-in subwoofer at its base. While other similar systems cannot provide a loud and clear sound, this solution will sound almost like a 2.1 system. 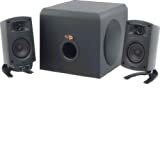 In addition to the performance that you get for a small size, the design of this set of speakers is unique, with larger circular bases and smaller circular tops. The speakers look like a combination between a cone and a cylinder, plus some very small details here and there. The frequency range of the sound is of 40 to 16,000 Hz, with an 85 dB sensitivity and an impressive impedance of 112 ohms. 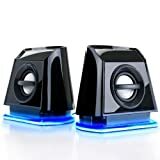 These speakers are very easy to use and they can connect to any type of computer. 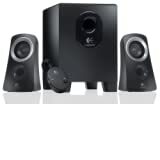 The only problem that the speakers may have is that some frequencies can be sometimes canceled by the powerful bass. But, if the bass is more important for you, along with the small size of the speakers, then this set will surely suits your needs. 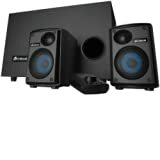 If you have an extremely low budget, this is a 2.1 system that has a price under fifty dollars and you will get a good performance for this price. Even if you will not get a full surround sound from this system, you can get a nice bass and a high quality sound from the satellites. I had such a system not long ago and it was enough for my gaming needs for the moment. Then, I realized I want to see how more expensive systems perform and this is the only reason I changed the Cyber Acoustics system for a better one. The frequency range of this system is of 50 to 20,000 Hz, with a power of 6 Watts for every speaker. Esthetically, this system is better than many expensive products. 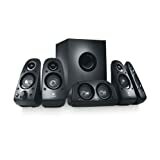 For under fifty dollars, this is a decent surround system to buy and probably the best solution for the price. You also get one year of warranty for this product. Of course, I have seen many other products under fifty dollars, but they lack the performance and the design that characterize this system. Creative is well known for its amazing audio systems and this one brings an immersive multi-channel surround sound, for a price of up to 150 dollars. The product can be characterized by having a classic appearance and design, but as being easier to use than other similar systems. 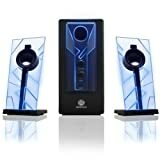 Some people may not like these speakers, because in some games they get a 2.1 sound, but it is not the fault of the system. If the game is not encoded for 5.1, you will only get three channels instead of six. My experience with this product was perfect, as I didn’t find any negative characteristic for it. The frequency response range is between 40 and 20,000 Hz and there are six Watts per channel. The subwoofer is of 20 Watts and the sensitivity is of 75 Db. A high frequency dispersion technology has been implemented. 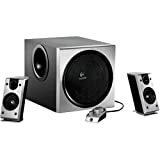 This is a 5.1 Sound system in the price range of 100-200 dollars (for used items and up to 500 if you buy a new one) and can be great for any gamer who wants to take the gaming experience to another level. The crystal clear sound will simply blow you away. While being in a game, you will actually have the impression you are in the middle of the action and for gamers, this may be the most important aspect. The system has a “matrix mode” that can be able to transform the stereo format of older games into a 5.1 audio experience. 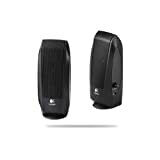 With 5 Watts for every speaker, a frequency response range between 40 and 20,000 Hz, Logitech X-540 has a new technology implemented. This feature is called Frequency Directed Dual Driver Technology. You will be able to hear exactly where the bullets in a game are flying and where the footsteps of game characters are found. This system from Samsung is actually a home cinema audio solution, but gamers can benefit from the ridiculously loud and clear sound that can come from this set of speakers. All you have to do to use this system for games is to use an optical cable from the receiver to your sound card. The main problem if you want to buy this system is the price of up to 1000 dollars. 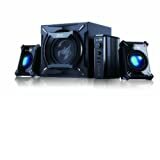 If the budget is not an issue for you, then you can have the ultimate gaming experience by using this audio system. I didn’t get this system myself, because I couldn’t afford it. But, a friend of mine has one and the only thing I could say when I heard the sound generated by it was: Wow! (just as the game he was playing is called). Even if this system was released a few years ago, it is still the best on the market. There are different technologies implemented in these speakers. Wi-Fi is included and the total output is of 130 Watts. The subwoofer with bass reflex has an output of 230 Watts. The speaker units are made of woven glass fiber. A 3D Blu-Ray receiver and an iPod cradle are included in the package. You will also get one year warranty. No matter what your expectations are, this high-end audio system will be above your expectations. These are just the main products from most price ranges, but there are other products that can be tried. Each of these systems is considered among the best gaming speakers of its kind. From the classical stereo system having only two smaller speakers, to the expensive 7.1 home cinema system, you will have to select the device that will suit your exact gaming needs. If you are not an avid gamer and you just want some decent sound for games, movies and music, a 2.1 sound system like the one from Cyber Acoustics and even a stereo system like the one from Altec Lansing may be enough. In any other case, you can choose a 5.1 audio system, or the high-end solution offered by Samsung.